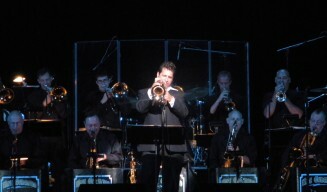 Mike Gurciullo has been associated with big bands ever since he was a kid in Omaha, NE. All through jr. high and high school he played in the usual school programs, but also worked outside of those settings in professional big bands in the local area. Upon completion of high school, Mike chose North Texas State University for his continuing education. There he got to work with great jazz educators Rich Matteson, Dan Haerle, and Jack Peterson. Outside of the university, Mike studied privately with world famous trumpet virtuoso, Don “Jake” Jacoby. While attending N.T.S.U., Mike formed his own big band called, “The Arctic Muther’s.” It was comprised of some of the best young talents in the music program at the time. Mike also co-led a big band with Don Jacoby called, “The Swing of Things.” While still in college, Mike did some touring with Guy Lombardo and His Royal Canadians under the direction of Art Mooney. Upon completion of N.T.S.U., Mike gigged for a year as the featured soloist with the world-famous Glenn Miller Orchestra. After a year, Mike moved west to Monterey, California. While there, he founded The Monterey Jazz Orchestra, and played Monday nights at Clint Eastwood’s Mission Ranch. After several years, Mike set forth for the Entertainment Capital of the World: Las Vegas. During his twelve years spent in Vegas, Mike worked most of the major showrooms with the headliners. He also carried the lead/jazz trumpet spot in the Wayne Newton Orchestra for 4 years. He traveled exclusively with Mr. Newton all over the US, Canada, and the 2006 Australian Tour. Mike also founded the Las Vegas Lab Band. He had the top-call players meet with him on Monday nights to bring some of the hottest big band jazz to the people of Las Vegas. Mike still works with many of the cats from Vegas in two shows called, “Drinkin, Singin, Swingin” and “Sinatra Forever.” In addition to Laughlin and Vegas, the shows tour throughout the U.S. In 2010, they capped a successful tour of Chile, South America, returning just days before the big earthquake struck.